The no. 3 seed Queen Bees (29-4), who were making their ninth appearance in the event, started off the game strong. They jumped out to a quick lead and continued to withstand any comeback attempt by the Lady Cougars throughout the game. The no. 6 seed Lady Cougars (21-9) trailed the Queen Bees 37-24 at the half. The Lady Cougars ended the game shooting just 26.6 percent from the field and fell to the Queen Bees 73-56. Senior Amanda Himes finished with 14 points and a game-high 16 rebounds in the final game of her career at MVNU, while senior Lauren Johnson added nine points in her final game. Junior Sierra Fletcher contributed 13 points and three steals, while junior Whitney Levering added seven points. The post-season for the Lady Cougars was bittersweet. They were ecstatic to be the first team in Lady Cougars’ history to make it to the NAIA tournament and wrap up another 20-win season, but they were sad to have an early exit from the tournament and see their successful team come to an end as the seniors played their final game. While the Lady Cougars suffered defeat in their first game of the tournament, the team still rejoiced in seeing junior Alexis Harkins reach a monumental milestone. With 9:28 left in the first half, Harkins made a reverse layup to become the 21st player in MVNU history to reach the 1,000 point mark. “I feel blessed to have reached the 1,000 point mark, but my teammates deserve the credit,” Harkins said. Coach Steve Gregory is extremely proud of the way his players conducted themselves at the NAIA tournament. “We were really excited for the opportunity to play again and to finally represent MVNU in this tournament,” Harkins said. Reaching the NAIA tournament was a great achievement for the Lady Cougars and something that hasn’t been done by the MVNU women’s basketball team in 33 years. 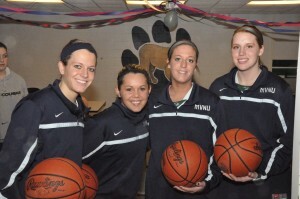 The four seniors–Amanda Himes, Lauren Johnson, Kellie Jokela and Kelli Pollock– brought much success and leadership to the Lady Cougars over the past four years. They won more games at MVNU than any other women’s basketball team in MVNU history. They also set quite a foundation for the rest of the squad that is returning next season.